Did you know that your body absorbs more chlorine through the skin and lungs while showering than while drinking tap water? This can irritate your lungs and have seriously harmful side effects over time. Chlorine also strips protein from your skin and hair, leaving it dry and itchy. 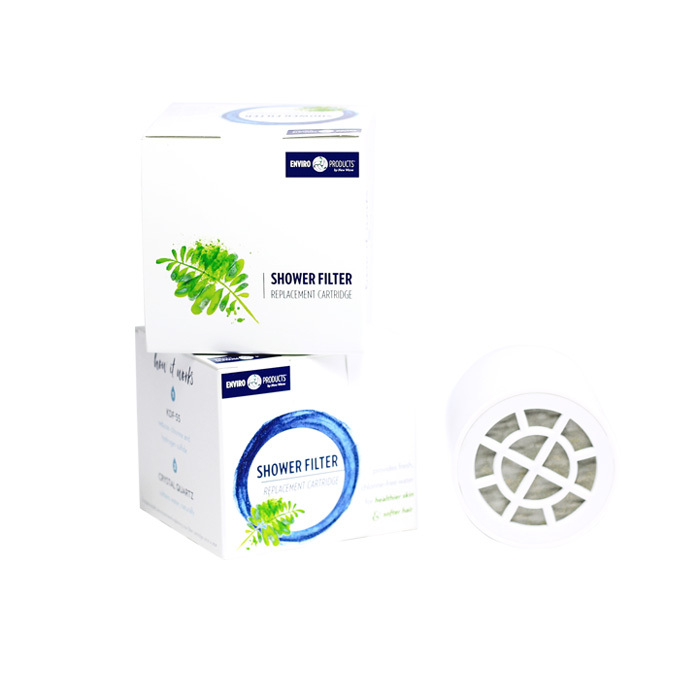 Get relief with an Enviro Products Shower Filter! — The Enviro Shower Filters contain 16oz of bacteriostatic KDF-55 and 2oz of crystal quartz. Together, they remove chlorine and hydrogen sulfide, reduce heavy metals and naturally soften the water. They fit all showers; simply screw on between the water pipe and your favorite shower head – No Plumbing Required! 1 lb 4 oz. 5.5 in. 9.9 in. 3.2 in. Remove the shower head from the shower filter by turning counter-clockwise. Next, unscrew the shower filter from the shower arm by also turning counterclockwise. Unscrewing can usually be done by hand, but you may need a wrench if your shower head or filter is on too tight (use a soft cloth to protect the finish if using a wrench). Open the shower filter by turning the bottom half counterclockwise until it separates from the top half. Remove the old filter cartridge and throw it away. Place the new filter cartridge in its place, verify the rubber o-rings are in place and twist the two filter halves back together. 4. Place the shower filter back on the shower arm and turn clockwise to tighten by hand. Then twist on your shower head and also tighten by turning clockwise. Over time build up can deposit inside the filter and may hinder opening the filter. To counteract the build-up it would be best to run the shower filter under warm water and vinegar to break up any build up. If additional tightening is needed, use a soft cloth to protect the finish and tighten with a wrench. Then enjoy!